The Vecna BEAR robot (Battlefield Extraction and Retrieval Robot) is being developed as an adjunct to other rescue technologies. Update: 15-May-2007: See also this more recent article Vecna Bear Robot Prototype Ready. End update. 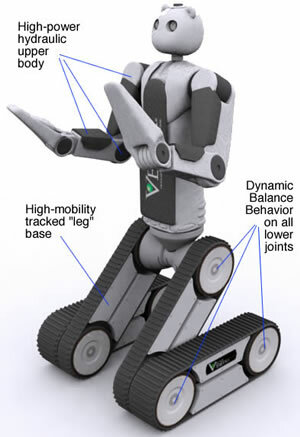 The BEAR bot has three main elements; hydraulic upper body, mobile platform and dynamic balancing behavior. The robot should be able to fully stand up by straightening the tracked units. "Robotic extraction of combat casualties from under fire or from hostile or contaminated environments is the 'holy grail' of the TATRC mobile robotics program. The BEAR prototype as envisioned in the VECNA proposal and current research contract is the most promising approach I have seen to safely extracting casualties from urban and wooded terrain or from other areas with numerous obstacles that would impede entrance by other vehicular or aerial robots. The versatility and flexibility of the BEAR that would enable it to do multiple combat support tasks — such as loading vehicles or carrying heavy equipment — make it more attractive than other robots that can only support a limited set of specialized tasks." 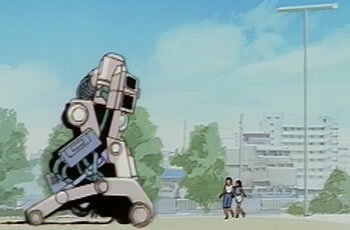 In the excellent Japanese manga film Roujin Z, introduced in 1996, the Ministry of Health orders Takazawa Kijuro, an elderly bed-ridden man seemingly without family, to test a new robot - the Z-0001. A self-contained atomic power reactor gives this unique part bed/part machine robot all the energy it needs. The man is literally wired into the bed. As it turns out, this is quite the military robot. Dr. Gilbert may want to check his specifications for BEAR after seeing this film. Read more about Roujin-Z and Robot Elder Care. Read more about the Vecna BEAR robot via freshcreation.